On Skatter Tech we constantly emphasize purchasing cases for your expensive gadgets to maximize protection and to prevent them from experiencing any damage. 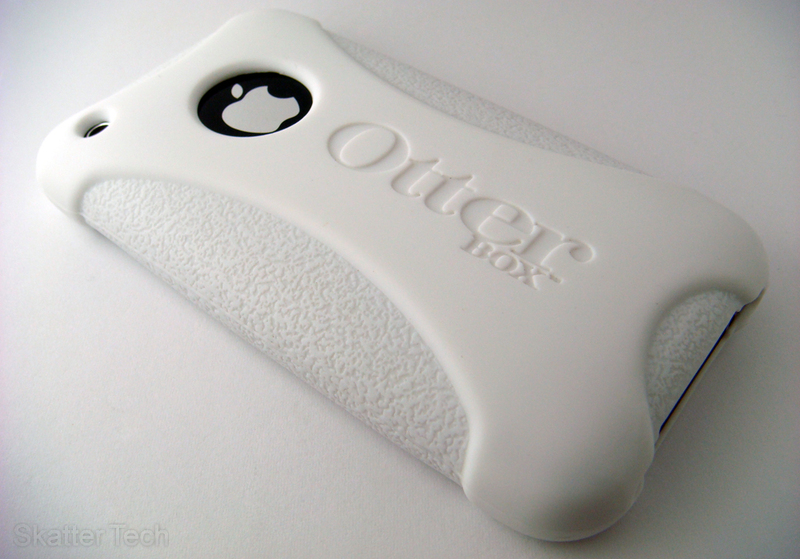 Today we’ve got a look at the Impact Case for the iPhone 3G/3GS by OtterBox. The company specializes in making heavy duty cases for just about every popular gadget on the market. Some of their cases look as though they could be run over by a tank and still survive. Some of these items are a bit overkill for the average user, but there are definitely situations where they would be put to good use. Fortunately the Impact Case being reviewed is fairly compact, offers decent protection, and is affordable. Some cases I’ve come across have been quite a pain to install. Placing the iPhone 3GS into the OtterBox Impact Case takes just a few seconds. The silicone case easily stretches to let the device slide in. The Screen Protector wasn’t too difficult to install. Just clean the screen with a microfiber cloth first, then wipe it down with the cloth they provide to clear off any lint.I aligned and placed the screen protector onto the display from the top to bottom. A few large air pockets got caught in between, but they weren’t to difficult to push out with the included “application card.” Afterward just peel off the remaining layer. It’s quite tricky to find the right type of screen protector for touch screen devices. Although the included OtterBox screen protector looks clean once installed and is a welcome inclusion with the case, it has a few issues. First, visibility of the display is slightly reduced. Second, some of the touch screen’s sensitivity and responsiveness is lost. Third, it doesn’t feel too great on the finger either. We can say for sure it’s better than leaving your screen unprotected, however there are better iPhone screen protectors available. But considering the price of the entire package, it’s reasonable. In the end, you need something that will be durable enough to prevent scratches while being still sensitive enough to use. And that’s exactly what you get. 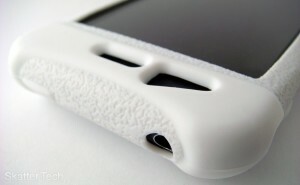 The Impact Case protects just about the entire iPhone 3GS. The touch screen display is of course left open. OtterBox also made a poor choice to design a circle cutout for the Apple Logo on the back of the device. I personally thing it looks horrible and just makes room for another vulnerability. Other than those openings, there’s also small incisions made for the dock connector, speakers, the ringer switch, the headphone jack, the earpiece, ambient light sensor, and camera. The volume rocker, power button, and home key are all functional while in the case. One issue was the usability of the home button. In the beginning it was quite easy to press, however after a few days of use, the case covering that portion began to become thinner making it more difficult to click. If there was a small bulge over that area as there is with other buttons covered by the case, that might help. The thickness on the sides of the case were a bit too thin as well. They might be useful to prevent scratching the bezel of the phone from scratches, but not from shock absorption. The silicone is extra thick around the top/bottom ends of the case and is designed in that fashion for a purpose. Those two areas obtrude enough that they would be the first part of the device to touch the ground during a fall. 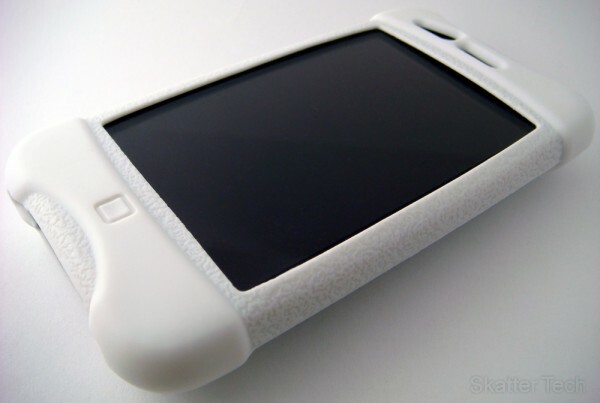 As implied by the name of the product, the case is designed help reduce the impact the iPhone 3G faces if it were to be dropped. And after handling it for a couple days, I definitely feel it will do a good job at what it was intended to do! Overall the Impact Case, deserves to be well noted and considered when looking to purchase a new case for your Apple iPhone. The case OtterBox provided us was white, which didn’t go along so well with my Black iPhone. OtterBox offers the case in black as well, so no need to worry. I would recommend sticking with a matching color. In the end, the bottom line is how well it protects your device. The OtterBox Impact Case will go a long way to saving your device from total destruction in the event of a collision. It’s available for purchase at a reasonable price of $19 directly from OtterBox’s website.